When I heard about Blogtober, I knew I had to join in. The idea is: Mandi over at Big Family Chaos has put together a list of daily prompts. I write a blog post each day, based on that day’s prompt. (The full list is at the bottom of this post). Today’s prompts were, “All about me / A Year Later.” For day 1, I have chosen All about me…. So Hello….. I’m Tee (or Tina when I’m in trouble). I’ve been blogging since 2009, in various places. I started off with a weight loss blog, which saw me lose over 60lb and make lots of online friends all over the world. It saw me get married, lose a baby and then get pregnant with my first child. I felt like a fraud then, so gave up blogging when I was about 4 months pregnant. When my son was born, I stumbled upon parent bloggers, which was still a fairly new thing in 2011. I immediately decided I needed to start one for us, as I missed having somewhere to express myself. Hubby is definitely the technical one. He set up MotherGeek.co.uk for me, and I have blogged there ever since. Now the kids are both in full time school, I found myself being less “mum” and more “Tee” than I had in a long time. It felt fraudulent writing about “me” on a parent blog, so GirlsGospel was born. I now work from home as a blogger and copywriter. It’s perfect as it means I can be here for my family, and our dogs (did I mention I have 2 needy boxer pups)? I’m almost 35 now and am definitely feeling my age. I’m embracing my grey hair at the moment – in fact, I’m getting grey highlights tomorrow to fully embrace the grey. EEK! That’s about it for today. If I waffle on too much today, I won’t have anything to share tomorrow! Here’s the list of daily prompts – why not join in too? Check out my other Blogtober blog posts here. 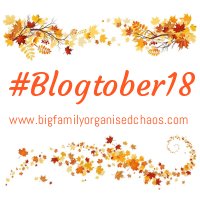 You can also find blog posts from other bloggers via the Big Family Chaos linky, by clicking the badge below. Well done on the weight loss. I’m in awe of people who have more than one blog. I keep thinking about it but I don’t think I’d manage to keep up with 2 blogs! I”m finding it easier if anything. Commenting is a pain (as in commenting on other blogs). I feel like I have got split personality when commenting from both of mine onto the same post hehe! Welcome to Blogtober! I can’t wait to hear more about Tee instead of Mum, although hearing about S&S and M&M are just as great reads too! That weight loss is amazing! Well done you. Thank you 🙂 You too! Good luck with turning grey tomorrow! Thanks – I think I’ll need it haha! Getting cold feet now!